The children in the RE program will once again be creating holiday gift bags for people in the congregation who are unable to get to church on a regular basis or who have had a difficult year and could benefit from a remembrance from FUUSN at holiday time. 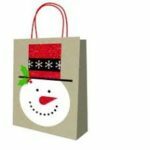 We are looking for individuals or families to deliver the bags on or after December 9, an activity that is a great way of giving back to your community during the holiday season. Please contact Kim Shanks (kashanks@comcast.net) if you are interested in delivering a bag, or stop by the RE table on Sunday, December 9 during coffee hour to pick one up.